The VAMO, with its solid performance and ease of use has been a consistent choice for both new and experienced vapers. In its latest iteration, the VAMO V6 joins the growing number of high wattage devices on the market by offering a 25 Watt output. 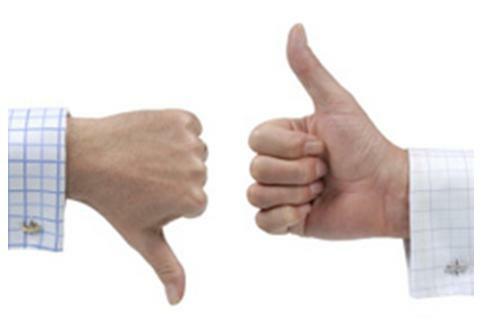 Smoktek has graciously provided one for this review. For those readers that are already familiar with the VAMO line and in particular the VAMO V5, go ahead and skip to the next section. 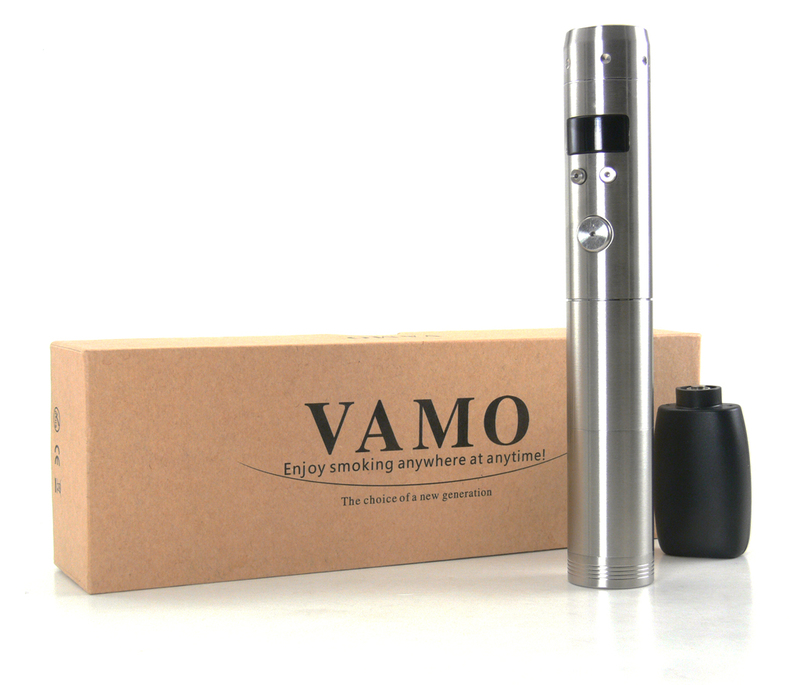 While there are some notable improvements under the hood, the 6th version of the VAMO is outwardly the same as 5th. There’s nothing wrong with building on a formula that works and that’s exactly what the VAMO V6 does. The body of our test model is nicely finished in brushed stainless and is also available in chrome and gunmetal. If previous versions are any indication, these finishes should wear well. It’s just under 14mm and weighs 5.7 ounces with the 18650 battery installed. A 22mm diameter matches that of many atomizers and tanks on the market, although I would like to see a non-beveled top cap to match something like a Kayfun more seamlessly. A removable top ring surrounds a 510 and eGo threaded connector, making the VAMO fully compatible with all toppers made for either standard. A vented bottom cap unscrews for battery removal and has a firm spring for solid battery connection. 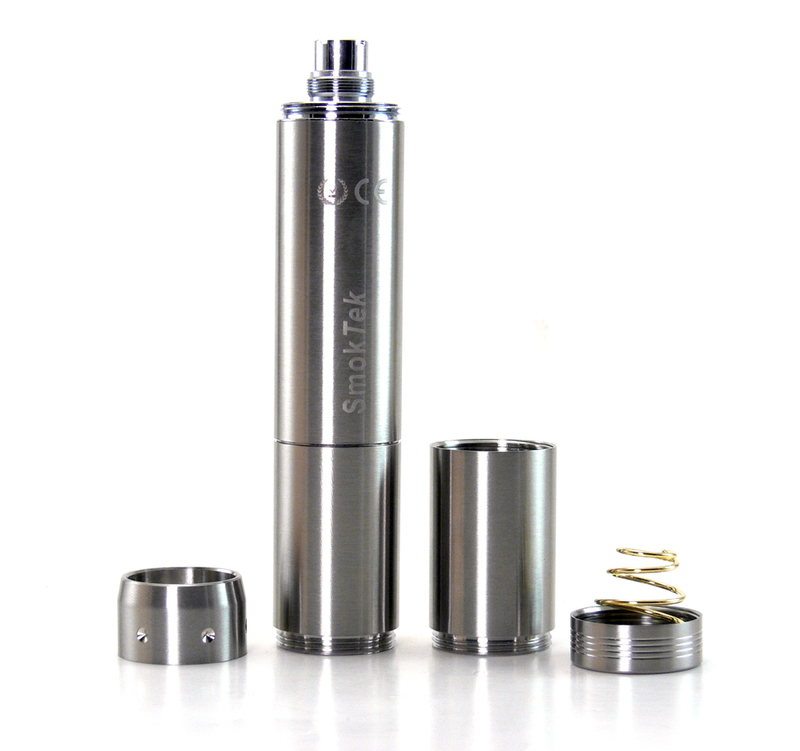 The bottom portion of the tube is also removable for use with a single 18350 battery, a VAMO hallmark. With the longer tube, the large spring allows for either a flat or button top 18650 or stacked 18350 batteries without the need for a longer bottom cap. The button arrangement is another familiar VAMO feature. There is a large fire button that activates the device when pressed and also turns it on or off when pressed 5 times rapidly. Two smaller “-” and “+” buttons are used to decrease or increase the power output, so in everyday use there is no need to access a menu system. Holding the “-” will display the remaining battery voltage and holding the “+” displays what I assume is a software revision number. Pressing and holding both “-” and “+” buttons activates the menu system, which we’ll get to in a moment. The OLED display is the most notable improvement over earlier VAMO models. It’s a nice clear light on dark display that shows all the relevant information at a glance when the fire button is pressed. By default it displays output wattage, output voltage, a graphical battery charge indicator and a puff counter. That last item appears in the lower right corner of the display and can be changed via the menu. Holding the “-” and “+” keys activates a menu system which is navigated using the two smaller buttons, with the fire button serving as the enter key. The menu is fairly simple, but more robust than that of the V5. The option of whether to display a puff counter, resistance, output current or smoke time can be adjusted with the first menu item while turning the screen itself on or off is set with the second. The third option is used to switch the device into “Mobile” mode, which allows other mobile devices to be recharged using the capacity of the internal battery. This feature does require the addition of a 510 to USB adapter, which is included with the VAMO. I’m not sure of the usefulness as an emergency charger if it depends on having a specific adapter on hand, but it’s definitely easier than carrying another portable charging bank. “Setting” is the 4th menu option and it is a somewhat interesting one. There are Manual and Auto menu options that are used to adjust the action of the fire button and the timeout for each option. In Manual mode, the atomizer fires as long as the button is pressed, up to the set time out between 5 and 30 seconds – no short cutoff time here! The automatic mode is where things get interesting. When in automatic mode, after one click of the fire button the device will keep firing until either the timeout is reached or the button is pressed again. Again, the timeout can be set for anywhere from 5 to 30 seconds. I’d say that automatic firing for any longer than 10 seconds is not a great idea and I’m not sure holding my thumb on a button was a pressing issueto begin with, but it’s a nifty option. The VAMO V6 also includes the full complement of safety features, including low resistance, low battery, high voltage (over 9 volts) and reverse battery protection. There is also a hole in the bottom cap for emergency battery venting. As with the earlier renditions of the VAMO, the V6 offers no apologies performance. Only now the bar has been raised to 25 watts from the 15 of the V5. Wattage is easily adjusted with the “-” and “+” buttons in .5 ohm increments. The VAMO does not have a variable voltage option, but with the display also showing output voltage when the fire button is pressed, it’s easy to adjust voltage instead of wattage if so desired. The added wattage will certainly mean that hotter vapes can be had with typical low and medium resistance toppers. 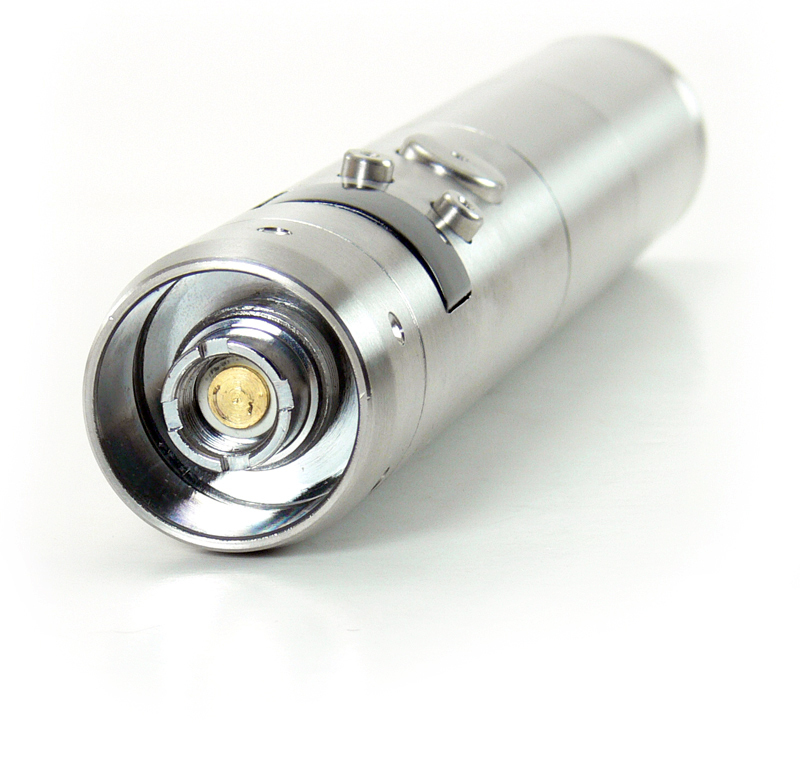 It also means that the VAMO should now have the power to fire even sub-ohm coils. Testing with a .7 ohm coil worked just fine in my tests, although the voltage topped out at about 3.4 volts with it. That’s still right around 5 amps of output, which is impressive. According to the information on the Smoktek site, resistance as low as .3 0hm with a single 18650 and .8 ohm with dual 18350s should be possible without triggering the low load warning. With more modest coils of 1.5ohm and above, the VAMO was happy to deliver anything I asked of it, right up to 25 watts, or a whopping 6 volts with a 1.5 ohm coil. That type of heat is really not my thing, but the VAMO V6 is quite capable of supplying it if desired. Every atomizer and tank that I’ve tried on the VAMO V6 has worked flawlessly. Both the 510 and eGo connectors have smooth, firm threads. The center pin on the connector is a little high, though, preventing most of my toppers from fitting flush. Of course, that also has the effect of ensuring a good connection and maintaining a gap for airflow. There are no holes or groves in the top cap for airflow, so I suppose that’s a good thing, but I could do with a smaller gap. Ease of use is where the VAMO V6 really shines. The three button arrangement makes it really easy to adjust settings and the informative screen leaves no doubt as to what the settings are. All three buttons have a great clicky feel and require just enough pressure to activate. The 5-click on/off makes locking the device for pocket placement simple as well. 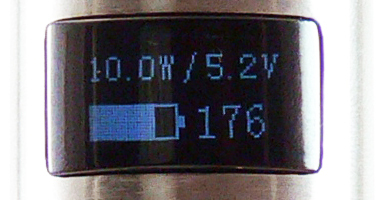 Battery life using an 18650 battery is very good, lasting me well over a day during fairly heavy vaping. In 18350 configuration the time between charges is shorter, as can be expected. The VAMO V6 doesn’t break a lot of new ground, but where it does it is quite successful. The increase in power to 25w is the most obvious improvement while the menu is system is also a great improvement although not as noticeable. I get the impression that the designers took a careful look at what could be improved. That’s refreshing in an industry where throwing designs at the market and seeing what works seems to be the norm. The solid design and ease of use make the VAMO V6 an easy device to recommend to new users and experienced vapers alike. At $59.99 from Smoktek ($80 with a battery and charger), it’s a good value for a device that should provide trouble free vaping for a long time. Nothing that I can see!